"Procrastination is attitude's natural assassin. There is nothing so fatiguing as an uncompleted task." William James, one of the founders of modern psychology, spoke those words. And how true they are! A few years ago, I heard a tip about procrastination that I never forgot. For me, it truly was an "a-ha moment!" Well, here it is...with a warning: Once you see this 2 minute movie, it'll be hard to forget! Procrastination is like masturbation. At first it feels good, but in the end you're only screwing yourself. ~Author unknown, possibly from Monty Python? If you are like most people today, you're overwhelmed with too much to do and too little time. Effective time management is the key to success in both your personal and professional life. "Eat That Frog! " is a metaphor for tackling the most challenging task of your day. Your most challenging task is the one you are most likely to put off--but it's also the one that will have the greatest positive impact on your life. It's time for you to get control of your life. It's time for you to become the master of time management. 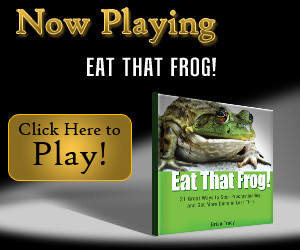 This book will make you more efficient and effective... Eat That Frog!! has sold over half a million copies and has been translated into 23 different languages. People all over the world have transformed their lives because of the simple and practical ideas I'll teach you in this book.